Oak Meadow fifth-grader celebrated as a role model. School officials and El Dorado Hills Rotarians recently honored Hannah Dardano as Student of the month. Oak Meadow fifth-grade teacher Sue Burkland said Hannah capably handles conflicts between her peers as a conflict manager and is always asking questions. "Hannah has this thirst for knowledge," Burkland explained. "She's just a great all-around person I'm so glad she came to our school." 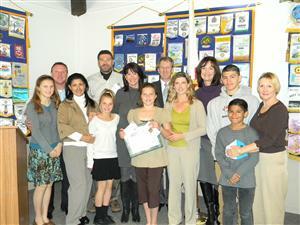 Hannah thanked the Rotary Club of El Dorado Hills and her family for all their support.